Do you know what vascular disease is? Vascular disease is the buildup of plaque and cholesterol in arteries throughout your body. Did you also know that your feet are an early warning system for vascular disease? It’s true! Your feet are often the first place where signs and symptoms of vascular disease appear. That is why podiatrists are often the first physicians to spot and diagnose vascular disease. What are some of the symptoms of vascular disease? Although these are common symptoms of vascular disease, many individuals with vascular disease do not experience typical leg symptoms such as cramping, pain, or fatigue known as claudication. Vascular disease can also manifest itself in the form of ulcers. You’ll most likely find a venous ulcer on the lower leg and ankle. You’ll most likely find an arterial ulcer on the side of the foot, but one can occur anywhere on the lower leg or foot. As you can see, signs of vascular disease can go from a simple pain in your foot or toes, to an ulcer. That is why it is important to know your risk for vascular disease. Not sure if you are at risk for vascular disease? Click on the image to take this quick quiz to find out! 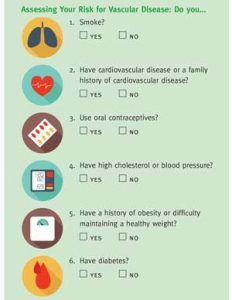 If you answered “yes” to one or more of these questions, then you are at risk for vascular disease. Fortunately, there are several preventive measures you can take to decrease your risk for developing vascular disease. Give us a call today to find out more about your risk for vascular disease and form a preventive treatment plan that’s right for you!